One of the very first questions every single entrepreneur must ask when they’re starting off is “What type of entity should my business be?” It’s easy for an entrepreneur to bypass the importance of this decision because they are lost in the excitement of getting started. Don’t let this happen to you. There are several types of legal entities forms available, and some may be more beneficial to the nature of your business than others. The structure you choose will impact future legal risks, taxes and how you raise capital. Before you make a decision, you have to understand how each type of entity works. Think about where your business wants to be in the next 5 years, review your options and choose the entity that will support you long-term. We cannot stress this enough. It’s normal to be enthusiastic about entering into a new business relationship, but sticking to an oral conversation is one of the biggest mistakes you can make – no matter how much you trust each other. It’s not personal, it’s business. If and when there is a dispute down the line, it will be easier for you to assert certain rights and remedies that you wouldn’t otherwise have if you only had an oral agreement. If you do not have your original agreements and responsibilitiesin writing, it comes down to your word against theirs. In that case, coming to a resolution or a compromise can be a lengthy and costly process which could have been avoided in the first place. This is another big one. Every business owner has proprietary information that belongs to their business. Non-Disclosure Agreements (or NDA’s) help protect your company’s sensitive information which can include customer lists, sales tactics or growth strategies that are exclusive to your business. NDA’s outline what information is confidential and what is fair game for everyone. By signing an NDA, the person with whom you plan to share proprietary information promises not to release it to any other person. It’s pivotal to ensure anyone that will have access to confidential and sensitive data about your business is legally bound by a Non-Disclosure Agreement because your secrets are your assets. This is the absolute biggest legal mistake small businesses make with the most serious repercussions. Most startups falsely believe that they don’t have the same need for an attorney that a bigger company would have. They believe serious legal disputes will only come into play when they scale and at that time they can just hire any attorney. This mistake can cost you money you can’t afford to lose and potentially your entire company. The best thing you can do is find a startup-minded attorney to make sure your company is set up correctly from the beginning. Hiring an attorney from the very beginning of your company’s existence allows that attorney to grow with you and understand every decision your business faces through its many phases of growth. It’s normal to be eager to get started, but ignoring these crucial legal steps could cost you your business later on. If you still have questions on this topic, we recommend reaching out to an experienced corporate attorney for advice. 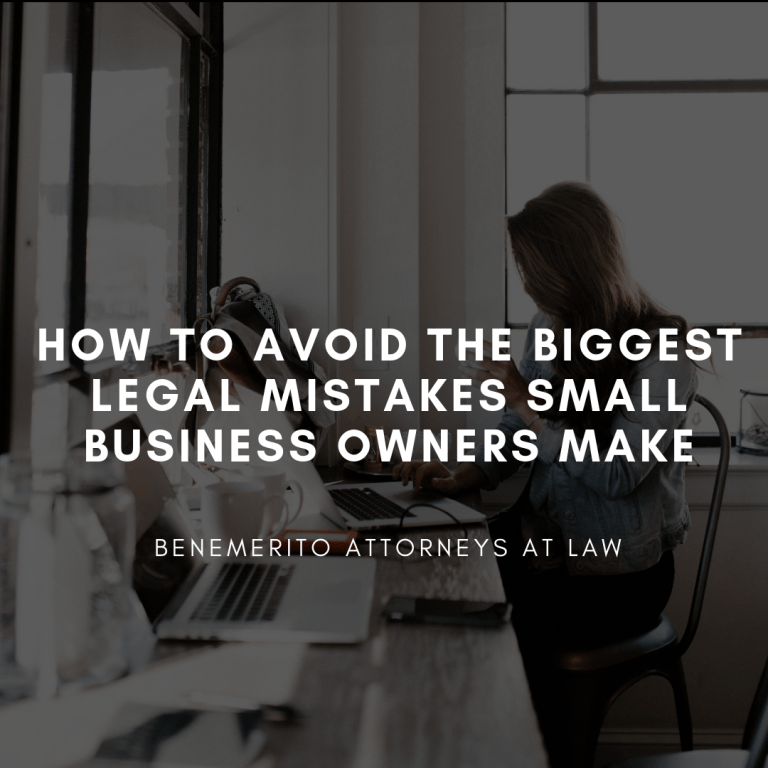 At Benemerito Attorneys at Law, we offer free consultations and would love to help guide you toward the right decision for your business. This blog is for informative purposes only. This information does not constitute legal advice. You should consult with a licensed attorney that can advise you according to your particular circumstances.